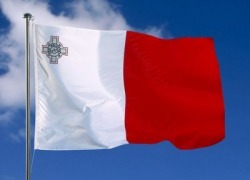 officially the Republic of Malta (Maltese: Repubblika ta' Malta), is a southern European country and consists of an archipelago situated centrally in the Mediterranean, 93 km south of Sicily and 288 km east of Tunisia, with the Strait of Gibraltar1,826 km to the west and Alexandria 1,510 km to the east. 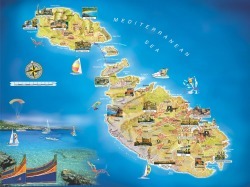 Malta covers just over 300 km² in land area, making it one of Europe's smallest and most densely populated countries. Its de factocapital is Valletta and the largest city is Birkirkara. Maltese is the national language and a co-official language, alongside English. Throughout history, Malta's location has given it great strategic importance and a sequence of powers including the Phoenicians,Greeks, Romans, Fatimids, Sicilians, Knights of St John, French and the British have all ruled the islands. Malta gained independencefrom Great Britain in 1964 and became a Republic in 1974, whilst retaining membership in the Commonwealth of Nations. It is a member of the United Nations (since 1964) and a member of the European Union (since 2004). Malta is also party to the Schengen Agreement (since 2007) and member of the eurozone (since 2008). Malta has a long Christian legacy and is an Apostolic See. According to the Acts of the Apostles, St. Paul was shipwrecked on "Melite", which many Bible scholars identify with Malta, and ministered there. Catholicism continues to be the official and dominantreligion in Malta. Malta is known for its world heritage sites, most prominently the Megalithic Temples which are the oldest free-standing structures in Europe. Yes now ok malta is a very beautiful counrty sort of but still the people here (some at least are crazy)see pics at www.onlyinmalta.com !!!!!!!! !CRAZY.